After a period of extreme amounts of loss, I want to hibernate. My sister has attended 7 funerals in the past year. We’ve lost our dad, our grandmother, a cousin, and two aunts. More in our close circle are fighting deadly diseases. We’ve watched our original family of 6 splinter and break. We are watching our mother leave us in increments before our eyes. I use my OCD to count the numbers of grief—how many have died, how many are losing the battle, how many have abandoned us, how much longer we might have mom with us. I can’t continue that counting game when it is so heartbreaking, so I get into bed to escape. I try to read books. I escape to other worlds in movie theaters. But none of those things help. The reality doesn’t change. I recently asked God, “How much longer is this going to go on? Don’t you think we’ve had enough? !” I knew I must be angry with Him at some level, though I didn’t feel it. I trust Him. But I also know I can trust Him and still be fighting mad at Him. Don’t you think we’ve had enough?! He’s so good. His answer came as soon as the accusation formed in my mind. I won’t even tell you my initial response. I’m sure you can guess. The audacity of that idea: giving more when I already felt stripped bare, clinging to the edge of sanity by my bloody fingernails, watching those I love doing the same thing. That’s the crux of it, I think. I can’t help those I love. Not when I’m hanging here, too. If I let go, what will happen? I’ll be lost and then I can’t help them at all. Give yourself away, He said. It didn’t make any sense. A week later I was asked to spend an hour filling a volunteer role for a friend who is ill. I was needed to spend time with an adorable young girl with Autism while her mom went to worship service. I only said yes because I love my friend and she’s been so helpful to us as we’ve struggled with our own son with special needs. After that hour of serving another, I heard it again: Give yourself away. The following week, my friend was still ill and she asked me again to serve that little girl for one hour. I wanted to say no because it’d been a hard week, but I couldn’t say no to my friend or that little girl who I now adored. Afterwards, He told me again: Give yourself away. 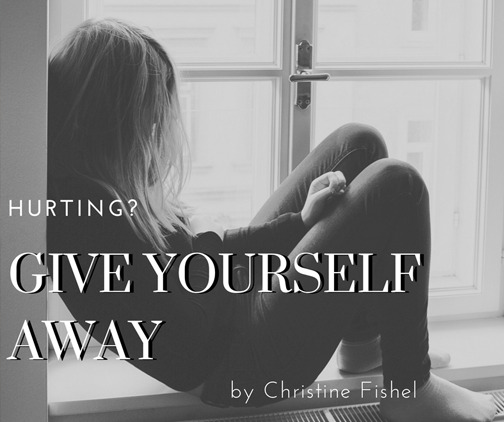 Over those two weeks, He gave me the same message in songs, words from other people, and a fortune cookie: Give yourself away. The Holy Spirit works that way. He gives us words from our Father in many ways and situations until we hear Him. I see now that He is giving me the way out of my pit. A way to remain steadfast in the storm of this season. Holding tight does not make us strong. Letting go allows us to stand firm. Giving away bits of ourselves is what makes us wholly healed. My sister has all the same hurts I do and more—illness and disease are threatening to take away several of her husband’s family; she sees the daily leaving of our mom as she provides her with daily nurturing. 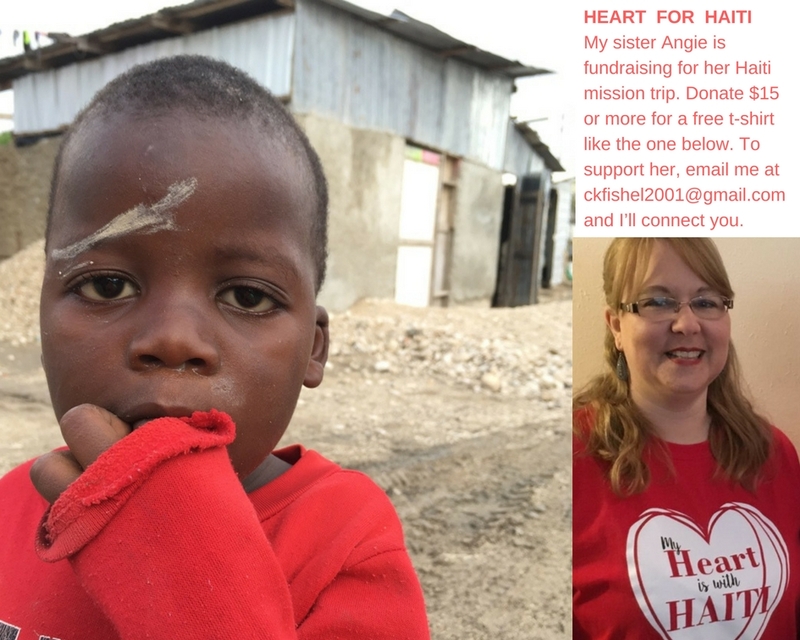 And yet look what she is doing: planning her first mission trip to the broken and hurting people in Haiti. She is giving herself away. Oh, Chris doesn’t God work in strange ways? Just when you think I have had it and say “No More,” He says “Yes More!” Sometimes I give until I feel there is just nothing left and then He refreshes me. Little things, like sunshine, a good night’s sleep, seeing a beautiful sunset and friendship. I cherish yours. I cherish your friendship too! It is so good to have a village of women who understand us holding and surrounding us. I pray you find refreshment today.